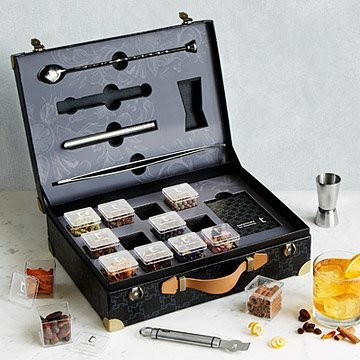 Stocked with 12 botanicals & 5 bar tools, this set will up your cocktail game to the stratosphere. Jell-O shots and appletinis—they're the past. Angostura bitters and vermouth are the present. Your cocktail-making future is inside this elegant suitcase. It's provisioned with a dozen hard-to-find botanicals from around the world and equipped with a full set of professional bar tools, moving you beyond the classics and into crafting extraordinary signature drinks. A deck of 20 botanical cards with recipes and recommendations for the included herbs, seeds, spices, flowers, and citrus completes this beautiful set. Tools included: twisted spoon, citrus zester, jigger, infuser, and precision tongs. Botanicals: juniper berries, cardamom, mace, kumquat peel, star anise, hibiscus flower, mallow flower, Persian roses, cassia cinnamon, allspice, giant coffee beans, and cocoa beans. Made in Spain. Clean tools with warm sudsy water. My husband loves making new cocktails for us to try. He loves experimenting with infusing unique flavors. We also love Spain and so the gift being from there made it extra special. The packaging was suburb and the case is fantastic to stay organized.